Sketchfab, one of the leading 3D model aggregators, continues to defend its turf from encroachment by Google. This time, the company has deployed a new API that gives developers even easier access to Sketchfab's extensive library. With Sketchfab's download API, augmented and virtual reality app developers can now implement a search tool that gives users the ability to search for and import 3D content from within their own apps. Along with the API, Sketchfab has launched importer add-ons for Unity, Unreal Engine, and Godot environments, as well as native integrations for Torch3D, Minsight, SpatialStories, Selerio, StellarX, Valorem's Holobeam, AnimVR, Plattar, Sketchbox3D, and Looking Glass. "Bringing 3D content everywhere also means sharing it outside of Sketchfab, so that it can be used in more ways, and as part of bigger projects," wrote Alban Denoyel, co-founder and CEO of Sketchfab, in a blog post announcing the new API. "We've spent the past six years becoming a sharing feature in as many ways to create 3D content as we could, and are integrated with more than 100 3D tools today. We are now going to reverse the switch, and work on letting anyone search and import Sketchfab content from their favorite tool, making those integrations a two-way street." Denoyel also noted that the company is working to make the import functionality available to additional company platforms such as Amazon Sumerian, Blender, and Meta. 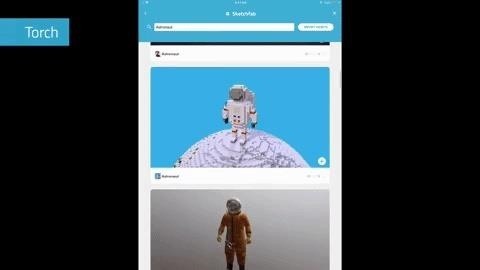 Since Google launched its Poly 3D content search tool last year, Sketchfab has responded with the beta release of its model store and mobile apps for previewing content. In fact, the new download API appears to be a direct response to Google Poly launching its Unity plugins and Unreal toolkit in Dec. 2017. However, with this latest move, Sketchfab not only closes a gap between itself and Google Poly, but also seems to have also surpassed its competitor with more integrations. But there's plenty of business to go around. The market for curating and creating 3D content will continue to expand alongside augmented and virtual reality, particularly now with Magic Leap opening up its Creator Portal and SDK to interested developers.